Lovely Loews Coronado Bay Resort. Ah, to be 20 again! Loews Coronado Bay Resort celebrates its big 20th Anniversary this month with a massive giveaway promotion, “20 Days, Your Way” – 20 free room nights to use anytime, any way you wish! Imagine if you were the lucky winner. What would you do during your stay? 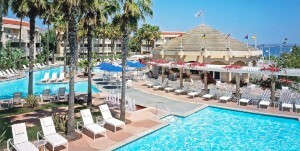 Luckily, Loews was made for play with its unique, postcard-perfect peninsular location on San Diego Bay and just steps away from Silver Strand State Beach. There’s so much to see and do in and around the resort, it’ll make your head swim – and that’s a good thing! 1. 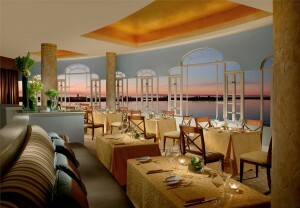 Dine at Mistral, where the French fine dining is as fabulous as the floor-to-ceiling bay views. Insider tip: Make a reservation for table #25, the dining room’s most romantic, picturesque spot. For more casual cuisine, Market Café is perfect with its patio overlooking Loews’ marina and the Coronado Cays. 2. 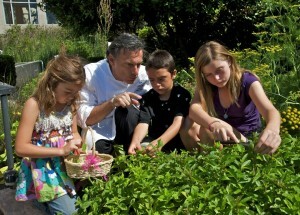 Take a tour of the resort’s abundant herb garden where Mistral’s chefs pick ingredients daily to incorporate into their menu. This is as fresh as it gets! In the swim at Loews Coronado Bay Resort! 3. Sip cocktails poolside at Loews’ three large outdoor pools, including one just for adults! Just say Ahh, at Sea Spa. 4. Indulge at the ocean-inspired Sea Spa, offering a bounty of blissful services like seaweed wraps, sea-salt scrubs, massages and even specialized treatments for couples, men and teens. 5. Swing over to the resort’s three lighted tennis courts to play a few sets, day or night! Stand-up paddle boarding at Loews marina. 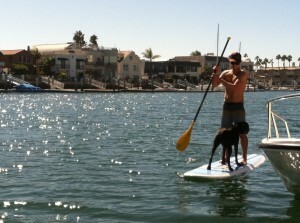 6.Stand-up paddle board with SUP Coronado and coast along the bay and canals of the Cays; tours depart from Loews’ marina. 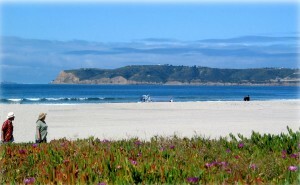 Or hang 10 off Silver Strand beach with Coronado Surfing Academy! 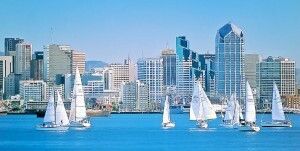 Sail away on scenic San Diego Bay! 7. Rent a sailboat from Action Sports Rentals for a spectacular sunset cruise; skipper included. Don’t forget the champagne and chocolate-covered strawberries –muy romantico! Kayaking with Action Sports Rentals. 8. Go kayaking with Action Sports. If you’re lucky, you might spot sea turtles which have been sighted in this part of South Bay! Gondola cruise on San Diego Bay. 9. 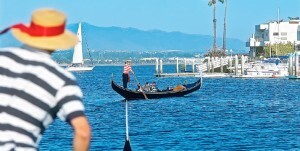 Be serenaded by a gondolier on an enchanting gondola cruise with The Gondola Company. Insider tip: Book the popular sunset cruise at least a week ahead of time. Spectacular views from Silver Strand State Beach. 10. Take a walk on the wild side with a park ranger at Silver Strand State Beachto spot rare plants, animals and birds of the bayside tidelands and Pacific shoreline. Tours depart from the lobby. Fantastic photo opp: colorful sea-themed murals lining the pedestrian tunnel to the beach! 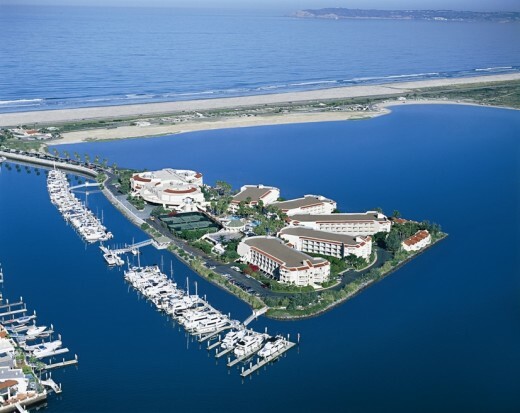 Enter Loews Coronado Bay Resort’s “20 Days, Your Way” giveaway today to win 20 free hotel nights! Deadline is Oct. 25. This entry was posted in Culinary, Hotels & Places to Stay, Insider Tips, Outdoor Adventures, Tours & Sightseeing and tagged anniversary, beach, coronado, Coronado Cays, dining, gondola, kayak, loews coronado bay resort, mistral, pacific, pools, sailing, san diego bay, Silver Strand, spa, stand-up paddle board, surfing, swim, tennis by Robert Arends. Bookmark the permalink.